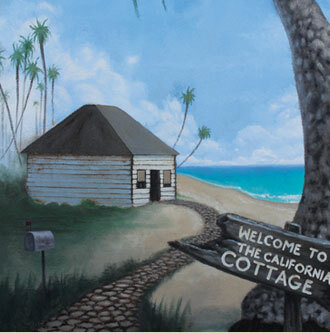 The California Cottage is a new "beach chic" decor store from the owners of California Seashell Company. just one block from the pier in sunny Seal Beach, CA. From cottage style furniture and shabby chic trimmings to garden & patio accents and gorgeous sterling silver jewelry, this new store is sure to give you some great decorating and gift ideas. And, of course, it wouldn't be apart of the California Seashell Company family without seashells, starfish and coral! John Haney, along with his wife Lisa, opened "the shell shop" on Main Street in Seal Beach in 1992. Recently having celebrated its 20th anniversary, they decided to expand their product lines and open The California Cottage. The new storefront is located almost directly across the street from their existing location. And sticking with tradition a custom mural has been painted on the facade thanks to the talented artists at Uglar Works.